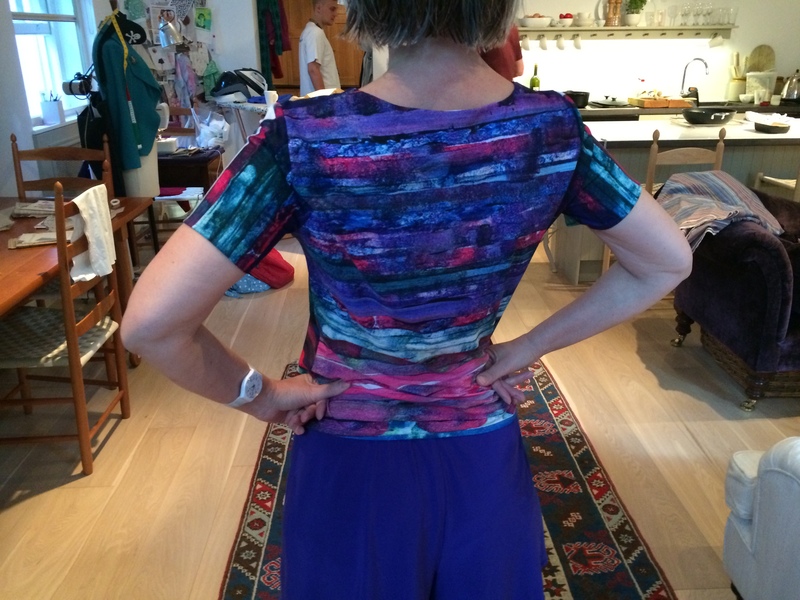 With a passable pair of purple running shorts, my attention turned to making a matching work-out top. For running and the gym I usually wear a sports bra, cut like a crop top. This is the coolest option, but for this challenge I decided to produce a self-printed T shirt to match my new shorts. I envisaged a top suitable for an outdoor run, but one that would also be fine with a pair of jeans. I used my T shirt block unaltered. This simple design is based on Winifred Aldrich’s jersey block. I also drafted short sleeves to fit. I will alter the pattern now I have made it up to include a bust dart. The fabric is not as stretchy as a T-shirt fabric and I think it would be more flattering with a bit more shape. I do textiles at the Mary Ward centre near Holborn. This term we have been using the heat press, to create digital prints, flocked and metallic finishes and heat transfer inks. The heat transfer dyes I used for this top do not work on natural fabrics (well they do, but they are quite washed out and not stable). To make use of the heat press techniques I acquired a nice remnant of white synthetic fabric from downstairs at Misan in Berwick Street. I prefer natural fabrics for everyday wear but of course sportswear almost requires modern, stretch, synthetic fabrics. Putting my printing experiments together with sportswear made a lot of sense. I think the fabric is a lightweight polyester jersey. 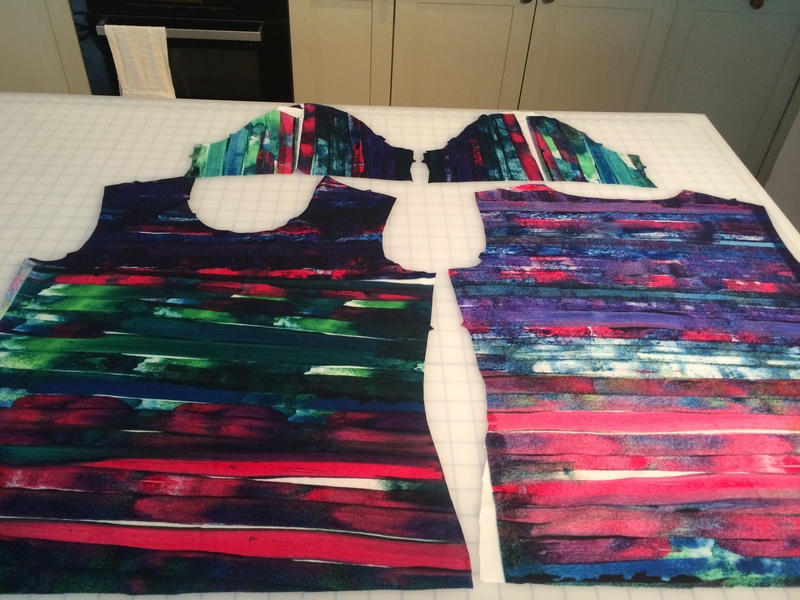 This involves painting special inks, which look fairly indeterminate in the bottle, onto paper, which is then heat pressed onto the synthetic fabric. I painted two sheets of A2 paper with a range of colours – blue, green, purple and pink, using a roller to produce a stripe effect. 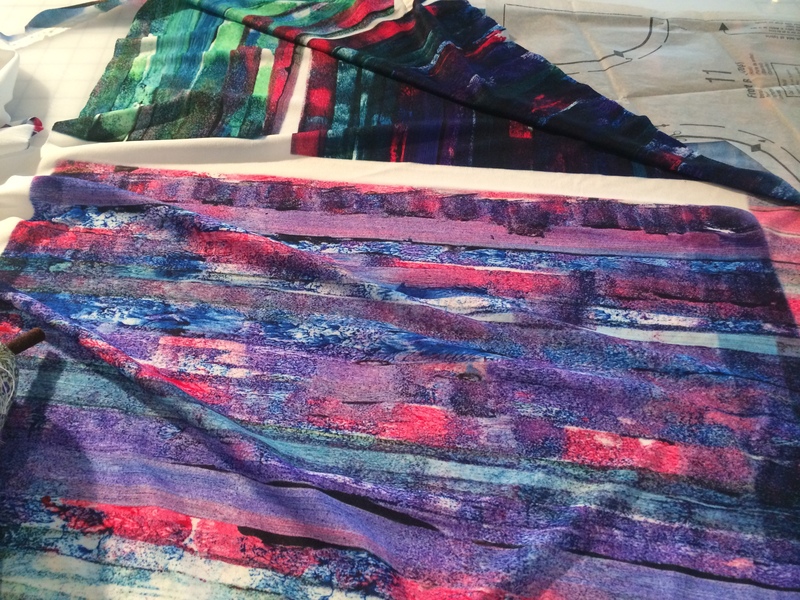 Once the muddy painting and fabric meet in the heat press, the dirty picture miraculously turns the white cloth into a glorious brightly hued textile. The students whoop in excitement, me included. However I find the heat press quite a scary piece of equipment. The fabric has to be printed between two pieces of teflon, the press is closed and the timer pings after a minute. While the first use of the paper is really intense and deep. I found that it could be used a second time to produce a similar print, but quite a bit lighter and also very beautiful. For my top I cut the front and back of the Tshirt from the stronger colours, but have the lighter fabric available for another use. I cut out the top trying to get the best bits onto the front and back, using the fabric across the grain for the sleeves. I cut facings for the neck opening. 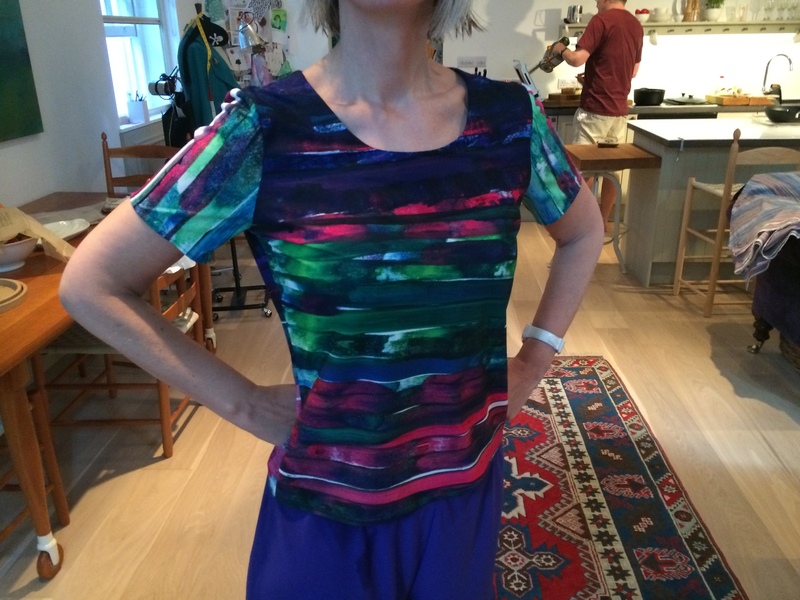 This T-shirt was simple to construct in the flat, with the side seams added after the sleeves were set in.